The premise of the vintage chic trend is to create a harmonious contrast between a masculine, rustic, unpolished, whimsical space and the delicate, lacy, flirty, feminine decorations within that space. 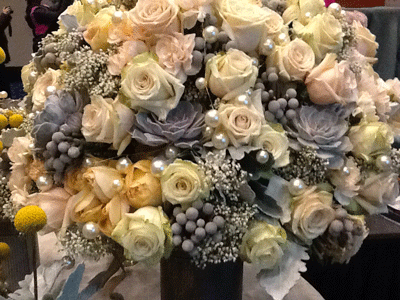 To get the tres chic shabby chic look for your wedding, try these design suggestions. For an aged look, print your invitations on rice paper, lace paper, handmade paper, unbleached recyclable paper or patty paper in an old typewriter font. Paste photos and romantic facts on similar paper and use old wooden clothespins to hang them from yarn or twine near windowsills. Cut out paper shapes into birds, trees, hearts—any natural, organic shapes—and pin them on photos and tablecloths, or glue them to popsicle sticks and place them in your table bouquets. Decorate with old-fashioned keyholes, lacy paper ornaments and streamers, tinted bottles, antique jars, perfume bottles, wine bottles, music boxes, old radios, record players, and vintage farm pitchers. Choose earthy table bouquets with moss and branches at the base. Use what could be your grandmother’s antique silver. Place vintage soda bottles and antique salt and pepper shakers on the table. Cover tables with embroidered linens or white lace.